It is Ferien right now, school holiday time. My oldest child has been hanging out at home mostly. I signed her up for an intensive swim class which despite being only 45 minutes, seems to have hi-jacked our entire afternoons. So, easy-going mornings have been welcomed for her and me. Sometimes she plays with her friend and classmate who lives just down the street from us, but she’s only allowed to do that after she’s practiced piano and done some pages in her enrichment workbooks (see my Tiger Mother stripes showing). This has been going smoothly, but this evening, while bringing my son to bed, my slow brain started catching up and realised, why I am wasting this time asking her to enrich on stuff that she already knows and knows pretty well? We should be reviewing all of the Hangeul (Korean language) that she’s been learning at Korean School. I am overdue posting about our Korean School here in Essen, which I HEART, and I promise to do so this month. 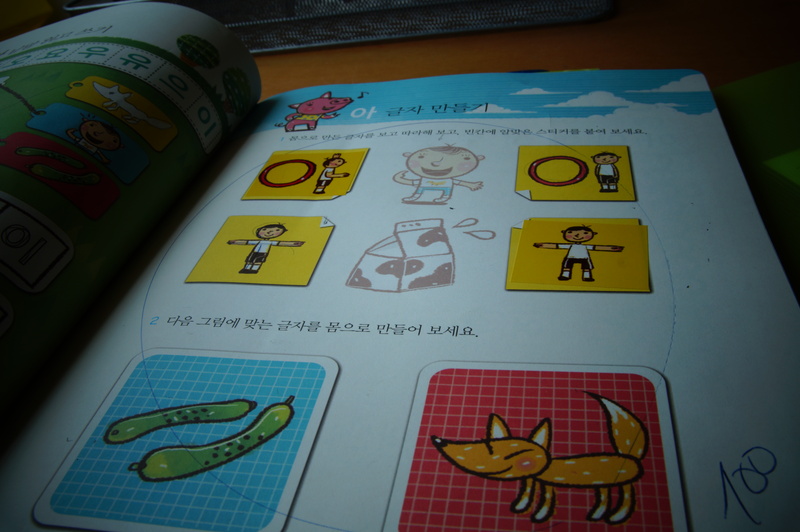 But, as I came out of my son’s bedroom, I found my two daughters quietly working on their Korean workbooks from Korean School. My five-year-old was filling in her table of ga, gya, geo, gyeo, go, gyo, gu, gyu, etc. and my seven-year-old had two workbooks opened in front of her and was neatly filling one out while referencing the other. You could have knocked me over with a feather. No, they are not always like this. Often time, I am agitated and irritated coming out of my son’s bedroom because they are typically jumping up and down, shouting (instead of talking) back and forth at each other in spite all of my “shh, shh, Lenny is going to sleep now!” efforts. Tonight, you could see two lovely halos over their gorgeous heads. Apparently, it was Vera’s (seven-years-old) idea to do Korean. This is a huge step in a different direction for us. When I think back on how agonising and almost damaging Korean School in San Diego was (the same experience that inspired my first children’s book manuscript) for the same child who said to me later this evening, “This is fun,” while we reviewed flashcards together, I could really shed a tear of joy. Tags: diasporic parenting, Essen, Korean diaspora, Korean School, third generation Koreans. Bookmark the permalink.